Inside the Moscone West hall on Tuesday, Steve Jobs basked in the cheers of both the marquee announcements that made up his Macworld Expo keynote. After announcing the availability of movie rentals through iTunes, Jobs ended his 101-minute keynote by taking the wraps off the MacBook Air, a super-slim addition to its portable lineup. It would be hard to gauge from the cheers during the keynote which of the two new announcement made the bigger impression. As for which product will be bigger for Apple in the weeks and months following the keynote, that all depends on who you ask. The MacBook Air breaks a lot of barriers, ushering Apple into the subnotebook market. While the competition may be strong, subnotebooks remain a niche market because no computer maker has really delivered that one product that everyone wants. That is clearly what Apple hopes to do with the MacBook Air. “It looks like a strong product in an area that Apple hasn’t addressed so far,” said Van Baker, vice president of research at IT-research firm Gartner. Baker added the MacBook Air will appeal to the Apple faithful for now, but will definitely help Apple in its efforts to build market share in all of its products. That’s a pretty good bet considering the way Apple’s laptop sales have been going recently. Laptops remain a key part of Apple’s business—the company sold more than 1.3 million laptops in its fiscal fourth quarter, which helped drive a second-consecutive quarter of record Mac sales. But this is definitely new territory for Apple, with new challenges. Ross Rubin, director of analysis at market-research firm NPD, reiterated his pre-keynote observation that three things have kept the subnotebook market small—price, battery life and poor design. Some may agree about MacBook Air’s $1,799 price tag, but with an estimated five hours of battery life and the design that Jobs showed off at his keynote, Apple seems to be off to a good start, analysts say. The MacBook Air doesn’t come with all of the features you would expect to see on a full-sized laptop. For instance, it’s missing an optical drive and many of the ports like FireWire and Ethernet that we have come to expect. Apple has taken care of some of those items by offering add-ons. You can buy a SuperDrive DVD burner for $99, and you can also buy an Ethernet adapter for $29. But Apple still makes the case that these add-ons won’t be needed. Obviously installing software is a huge thing, but Apple tackles that issue by having users temporarily borrow an optical drive from another Mac or PC over Wi-Fi and use that to install software. It’s a slick-looking feature when demoed in person. That said, mobile users may run into difficulty when they’re on the road and don’t have access to another machine. “It [MacBook Air] is designed for highly mobile users that are not tied down to legacies like wired Ethernet,” Rubin said. If nothing else, the other big announcement Tuesday—the arrival of movie rentals at the iTunes Store—reminded everyone that the Apple TV is far from forgotten in Cupertino. That’s especially true after an update to the set-top box lets users rent movies and buy songs and TV shows directly from their Apple TVs. According to Eddy Cue, Apple’s vice president of iTunes, and Greg Joswiak, Apple’s vice president of worldwide iPod marketing, movies rented from the Apple TV are downloaded in a format designed for optimal viewing on a large screen. Those movies are meant to stay on the Apple TV and will not be synced back to the computer or iPod. However, if you want to put a movie rental on your iPod, you can purchase from your Mac and then sync it. You can also watch that movie from your Apple TV if you choose. The new Apple TV will also show a complete list of your source computer and rental movies from the iTunes Store, which makes it very easy to search through your list of available media. And when you search for a movie through Apple TV, you can see actor and director names as well—a cool little feature that many movie buffs will appreciate. 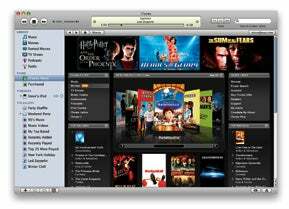 Even though Apple isn’t the first company to provide a way to rent movies online, analysts believe it will ultimately be more successful than others, thanks to the iTunes tie-in. On the surface, Apple faces a seemingly big rival in movie-rental leader Netflix, which announced unlimited movie streaming for subscribers in advance of this week’s Expo keynote. However, Netflix’s streaming service is not yet available for Mac users. What’s more, it can’t be played on an iPod or a TV—it just streams movies to a subscriber’s computer.